That is going to be a pretty quilt. Working with bias is really a hair pulling experience. I cut my squares as required, cut them once diagonally and then sew the 1/4″. I used to do the line bit, but this is the traditional way and it saves time. I always add 1/8″ (i.e. 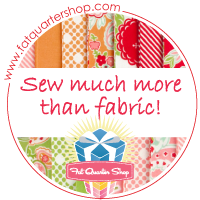 if the pattern calls for a 2 7/8″ square I round it up to 3″) so I have plenty of fabric to square my HSTs. If I am going to make flying geese I add an inch or so and cut the squares and then cut them twice diagonally. This prevents me from having any bias on the outer part of the blocks. When I first started quilting I used starch, but now, and only if necessary, I only use lite sizing. Starch causes bugs. Thought you might want to research that. I think it attracts silverfish. Your blocks are really going to make a beautiful quilt! Thanks Nan. About halfway through this month’s pattern I decided to always cut a bit extra for HSTs from now on. I’d love to see your flying geese method. I’m home today if you’re up to it. I’m down at 124. 🙂 The method used in the pattern is the same as from Quilt in a Day – placing two smaller squares in opposite corners of a big square. But that left no room for trimming so I’m interested in another way. Hubs has his applicator’s license so we have zero bugs around here. The dogs are always in and out so he sprays the yards and all. I simply can’t tolerate fleas, ants, etc. Of course, if I gift a quilt, they are on their own. I did not get an email response from you so I missed coming by. What is another good day? I do like Eleanor’s for fast FG, she is the only one that a quilter can count on. But I think there is fabric waste. What size are the HSTs that you are working on? Wobbly seams, seriously?! It all looks pretty perfect to me and the finished thing is INCREDIBLE!